To me, Chicago is all about the juxtaposition. The picture-perfect serene lakefront right next to the expansive skyline… The most amazing summers and the harshest of winters… The big-city feel with the small town vibe… The list could go on and on! My style is definitely influenced by my surroundings and for some, style is all about where you grew up – I’m sure you can relate to one or the other! (Or maybe even both!) Considering I grew up in a “village” of 3,000 people in the middle of a cornfield, I wouldn’t necessarily say my style is influenced by small-town Illinois. But it’s always been important to me to remember where I came from, in a lot of different ways. 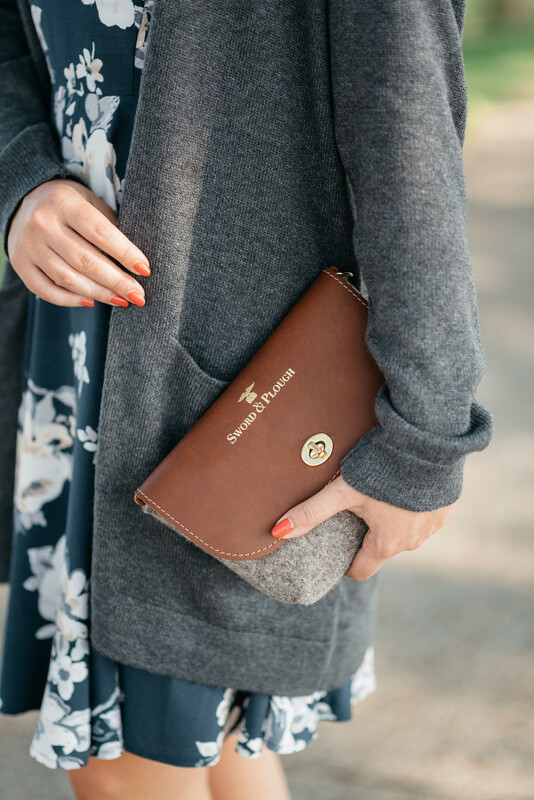 When it comes to my personal style, I’ve always been one to gravitate towards juxtaposition. I love adding just the right amount of masculinity to my overly feminine outfits! A military-inspired jacket over a lace top… Wearing a dress with your sneakers… A boxy denim jacket over the girliest of dresses… A chambray layered under a sequin tee… Baggy boyfriend pants paired with a pointed toe pump… A plaid shirt tucked into a sequin shirt… Moto jeans with a ruffled feminine jacket… You get the idea! I love how this grey floral dress is definitely feminine with the print, but the colorway is a bit androgynous (especially when paired with a long, oversized cardigan!). In Chicago, comfort ends up being the deciding factor with most fashion-related questions! Chicago’s weather can be absolutely bizarre… 90 degrees one day and snowing the next. (That’s a bit of an exaggeration, but not too far off!) It’s a city with all four seasons and just about every single storm and element! At the core of most of my outfits, I tend to dress for practicality. I think that personal style ‘rule’ was majorly influenced by New York, as well. You’ve got to be able to walk a few blocks and take the subway stairs in your shoes! In terms of comfort in Chicago, I’m a total baby when it comes to being cold. Layers upon layers are key for me, and I’ve learned to love hats and beanies to keep my head warm, too. I try to make it fashionable, but it’s got to be functional, too! Even as it’s just now starting to cool down, I always have some sort of jacket or sweater in my bag when I leave for the day. 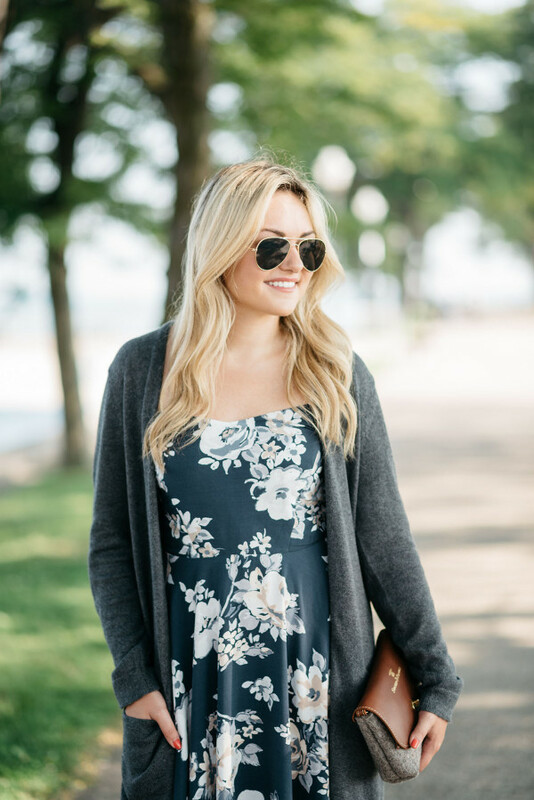 When I saw this long cardigan, I knew I had to have it… And I’ve worn it just about every day since! It’s perfect to toss on during this sometimes-awkward transition between seasons. How has your hometown or current city influenced your style?! Be sure to share your own stately style outfit snaps all over the USA with #50Styles50States! Love the dress and such pretty photos of chi town! Old navy has had some great pieces recently especially their dresses. I love how this looks both comfy and cool! You are so cute girl! LOVE that dress! Cute dress! I love the look! 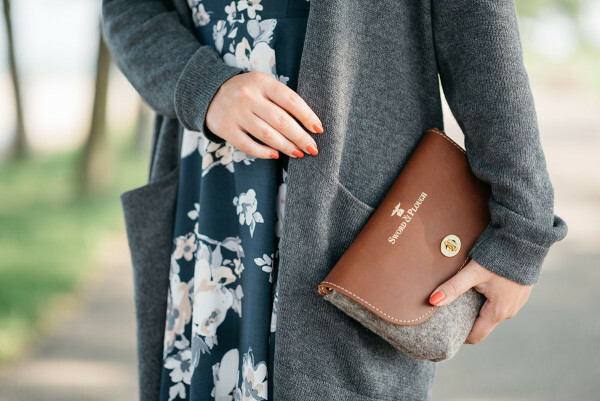 Such a lovely dress, gorgeous bag and stunning photos! Such a lovely look ! You looks so good. And i really love your hair. I just love these photos against the Chicago skyline, so pretty! And I’m totally with you on mixing masculine with feminine, it’s the best combo. I love the combination of the floral dress with the booties. Soooo cute!!! I love this outfit! Such a good way to transfer summer dresses for fall.